Great book! Dr. Jeremiah's presentation of the rapture, the 2nd coming of Jesus, the Tribulation, the Thousand Year Reign of Christ on earth, and the Eternal State are easy to understand. This book reads fast without bogging the reader down with unnecessary information. Dr. Jeremiah brought so much light to my understanding of the end of this earthy time. After reading/studing his book , we purchased a few more for our church family to learn more and enjoy. Thank you and God Bless! 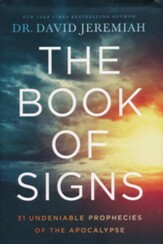 This review was written for The Book of Signs: 31 Undeniable Prophecies of the Apocalypse - eBook. The thing I like most about David Jeremiah's books is he doesn't do what a lot of writers do. He doesn't tell you something because HE said so, He tells you something and then shows you the bible passages that prove the truth of what he is saying. I don't agree with every interpretation he has ever made. But this book is spot on. This is an excellent book by Dr. Jeremiah about the end times. He goes into the prophesies that God gives us in the Bible and explains them in such wonderful detail but in a way that is totally understandable. This is an extensive volume that made clear so many of the speculations we have about the end times. He also brings current events into focus and helps us to understand how they point to God's prophesies. I found this very interesting as I enjoy having current events - political, weather, and more - brought more into focus from a Biblical point of view. He explains the rapture, resurrection, and what will happen when Jesus returns. He explains how different countries will play a part in the end times and I really learned a lot. He shares the signs of what to look for in Jesus' returning and what signs have already taken place. I enjoyed this book so much. It was really hard to even put down and I highlighted extensively throughout the book. I highly recommend this book for anyone who wants to understand the prophetic parts of the Bible that refer to the coming of the Lord. I give this book 5 stars. *This book was provided to me by BookLookBloggers. I received a copy of this book to review but I was not financially compensated in any way. The opinions expressed are my own and are based on my observations while reading this book.